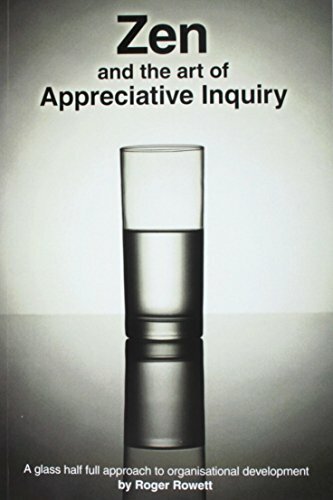 The book provides a step by step guide to the use of Appreciative Inquiry, a 'glass half full' approach to organisational development. It also describes the author's journey in relation to his understanding of AI and how it made sense of his map of the world. The book takes readers through the 5D process, a proven method of taking the workforce and other stakeholders through a process of culture change and business improvement. The process has been successfully used by organisations across the world and is known for its ability to engage and motivate people, ensuring that actions are sustainable into the long term. "Those of us working across the domain of organisational development who have occasionally flirted with Appreciative Inquiry as a change technology, will immediately see the value of this book. It captures the essence of engaging and transforming the way we think and act and reminds us of the most important ingredient in delivering organisational change – people. For those who perhaps, have little knowledge or experience of Appreciative Inquiry, but a keen interest in expanding their personal and professional horizons to discover new ways of delivering change – this book provides a solid platform for beginning the journey. As a description of the Appreciative Inquiry process, it offers an intuitive and experiential account of how to engineer change in an engaging and liberating way. It provides a solid evidence base for re-thinking the approach we take when working with organisations to transform practice. But more than this, Roger Rowett introduces us to a different way of understanding the world beyond the application of a set of principles and procedures. In a warm and self-deprecating way, he convinces us that to fully understand and engage with the idea of Appreciative Inquiry we have to recognise the sanctity of relationship and the ocean of human potential that exists in everyone. In this regard, Appreciative Inquiry is an invitation to see the world in a different way, to re-construct the social and to acknowledge the connectivity of all things. We are reminded clearly that without exception, everything is delivered through relationship. Often in our desire to deliver change we focus upon the transactional, believing that small practical steps exchanged in the moment will lead to transformational outcomes. This is rarely the case. In fact, I am unable to recall a credible example of where this has occurred in the world of organisational development. ‘Zen and the Art of Appreciative Inquiry’ provides a template for making the art of the possible probable and for delivering breath-taking change through people. Some years ago, I was involved in helping an organisation to set a new course on its journey towards delivering world class healthcare. It wanted to radically reshape the way services were delivered based upon a new approach to working collaboratively with other delivery organisations, patients and the wider community. Using Appreciative Inquiry, to divine the future, 300 key stakeholders, some of whom were highly critical of the organisation with long established stories of contempt and criticism were brought together. The process was underpinned by the principles and practices detailed within this book. To my surprise, the outcome was transformational. Those who came to the workshop with long held grievances and ritualised distrust let go of their discontent and doubt, those who came with cynicism and disbelief rekindled their sense of hope that a new way could be found and those who came to be heard who already knew where the future lay were listened to. Everyone left feeling fulfilled, part of a greater good and confident of their future role in delivering a new way forward". Roger Rowett was born in 1955 in Liverpool, UK. He now lives in North Wales. He has worked for a wide range of organisations across the private, voluntary and statutory sectors. He has also worked within both the care and education inspectorates in Wales. Since 2005 he has been working independently as a business consultant within his company, Taith Ltd (www.taith.co.uk), carrying out organisational reviews and development activity. He also trains people in the use of Appreciative Inquiry, facilitates the process and is asked to speak to conferences and groups. Roger is passionate in his belief that we need to move away from our problem focused responses on both an individual and organisational level. He also believes that there is untapped potential within all of us that needs recognising and 'exploiting'. Most critically he believes (and the book describes) that we need to start where individuals are 'at', and a failure to do this results in lost opportunities to develop our most valuable asset - people.